Update :Macduff Hughes, Engineering Director for Google Translate commented that it is “Phonetic Keyboard Input rather than voice direct voice input” and hence in the video, it did not work properly. Here is his comment. 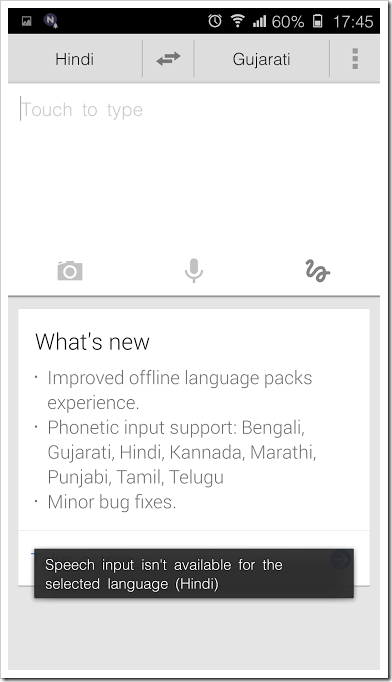 Google has updated their Translate app yesterday and this update brings Phonetic input support for 8 Indian languages of Bengali, Gujarati, Hindi, Kannada, Marathi, Punjabi, Tamil, Telugu. We tested out this new update on our Nexus 7 tablet running 4.4.2 version, and interestingly we could not get it to work properly. The new update accepts english input and converts it into hindi beautifully and even offers voice output for the translated sentence, however, when it comes to accepting hindi or Marathi language (we tried with these two language), it does not work. So, while Android has updated their app on play store with phonetic support for these 8 new languages, in reality it looks it does not work. We even tried it on couple of different phones including Nexus 4, but none of them accepted phonetic input from any of the Indian languages. We hope this is a temporary thing and most probably Google Translate’s backend engine must be having some temporary issues. However, we are sure that it will be soon fixed. One thing is sure though, it will be of tremendous help not only for foreign tourists visiting India, but also Indians as well. I can see myself using it when I go to Chennai or Kerala, where most people know only the local language. The great aspect about Google translate app is that it is quite seamless, you speak the language you know and it will translate it to the language your choice and then actually speak it out. So, over a period of time, I see need for physical translators diminish to a large extent. The translate Android app now supports translation between 80 different languages, and in most part it works quite well. What’s more, it recognizes some heavy accents also quite well! Over the years, Google has been steadily updating their translation and transliteration apps to offer support for more languages and they are getting better to the extent that it is now solving real world problem! Keeping aside the (temp) issue of Indic languages not working, I think this is one android app everyone should have on their phones. Give it a try and let us know what you feel. Micromax Launches Attractively Priced Windows Phones To Augment User Choices! Is Flipkart Deliberately Delaying Deliveries To Promote “Flipkart First”? Hello. Thank you for taking the time to look at this update to Google Translate for Android. The new feature that was added in this release is “phonetic input” for some Indic languages. This means typing phonetically with a Latin keyboard. For example you can type “namaste” in Hindi and Translate will offer to convert it to “??????”. Voice input for Indic languages is not supported. We regret that this was unclear to a number of users. We should have said “phonetic keyboard input” instead of just “phonetic input” in the app description. Aha… so now I understand the reason why it did not work. Thanks for dropping by and letting us know about it Macduff, much appreciated..